Caramel Turtle - Our newest spread flavor made with CASHEWS! Our Caramel Turtle Spread is specially formulated with highest quality milk chocolate, creamy rich caramel, and delicately sweet cashew butter! After one bite, you just can't stop! IT'S...THAT...GOOD!!!!!! Banana Raisin - Our newest flavor! An amazing mixture of Dry Roasted Peanuts, Whey Protein Isolate, and of course....RAISINS! With 14 grams of protein per serving and only 7g of carbs, this is a must have Spread in your arsenal! Weight Loss: It is proven that a high protein, lower carb diet helps people lose weight. Our bread provides that perfect balance of protein and carbs to help you on your journey to lose weight. One of the key ingredients in P28 is whey protein isolate, which benefits you because it is clean, fast absorbing, and helps increase your metabolic rate which in turn burns body fat. Also included in our bread is whole wheat, which is a good source of fiber along with the flax seed and helps with digestion. The complex carbs of whole wheat will give you sustained energy to help fuel your day. Bodybuilding: P28 High Protein Bread is a great choice for bodybuilders. It provides great nutritionals and is extremely convenient. Most bodybuilders eat every 2-3 hours, so convenience is extremely important. 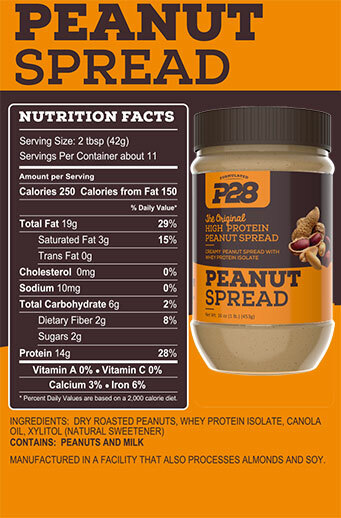 P28 can be used to create many quick and healthy snacks such as a peanut butter sandwich. A peanut butter sandwich offers up to 35g or better of protein. We all know protein = muscle. P28 is an excellent alternative to your shakes or whole foods without losing any nutritional value, which allows you to grow or maintain to be the best bodybuilder you can be! Athletes/Endurance: Athletes Exercise increases the need for carbs and protein. Athletes need great sources of complex carbs for energy. With our product being made of whole wheat, it allows the athlete to have a great sustained source of energy throughout the game or event. Ahtletes also are in need of a great source of protein to help in the repairing and recovery of the muscle. Children: Nutrition is extremely important to your child's overall health. Proper nutrition can prevent many health issues such as weight issues, preventing diabetes, and preventing weak bones. The best way to teach our kids is by eating healthy ourselves to set a good example. Kids can be very finicky at times with their diet. Some like chicken, meats, and fish as proteins. And some don't. The same goes for different types of carbohydrates. That's why P28 is a great alternative for your kids to have a great tasting meal, packed with the perfect balance of protein and carbs. Children can eat P28 with their sandwich for lunch, toast for breakfast, or even just by itself. Your children will thank you! Healthy Aging: As we get older, nutrition plays an important role in how we age. Making the right choice in the types of food we eat is very vital. 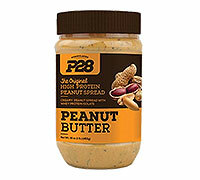 P28 is an easy choice to incorporate as a fast and easy digesting protein to help you maintain and rebuild muscle. By having enough muscle as we get older, we can prevent bone loss and stay strong to get around easier and enjoy our gracefully aging lives. Also, as we get older we want to be able to stay active and not feel sluggish by mid-afternoon. That is where the complex carb of whole wheat comes into play. Whole wheat will help your energy levels stay high until your next meal, without feeling hungry in between. This also allows you to maintain a healthy weight. Whole wheat is considered a heart healthy grain loaded with antioxidants to help prevent heart disease, diabetes, and high cholesterol. Vegetarian: For those vegetarians that allow dairy into your diets, P28 is perfect for you! Our product is made with 100% whole isolate. With protein being one nutrient that vegetarians lack in their diets, P28 can help get the cleanest and easist to absorb protein into their system. Whole food protein is very important to your daily diet. However, being a vegetarian you won't be consuming much protein rich meat anytime soon. That's why P28 is the perfect choice to supplement in the protein you are lacking! P28 also contains an abundance of amino acids, antioxidants, and minerals that will play an important role in your diet. Also, our product is made with 100% whole wheat which will help you sustain great energy levels throughout your day. On top of all that, we also include flax seed and sunflower seed in our bread, which will help with your digestion, be a quick energy source, and will be a good source of Omega 3 and 6's. Diabetes: A good nutritious diet is pivotal in keeping your blood glucose levels stable. With P28, you can help to maintain your blood glucose levels as well as controling your weight. Cinnamon is an ingredient in our bread that can play a huge role in helping reduce your blood sugar levels. Bariatric Patients P28 High Protein Bread is a great staple food for any bariatric patient. With 14g of protein per slice, the possibilities are endless for the uses of P28 bread in our limited diet. Bariatric patients must meet a minimum requirement of 60g of protein per day. For many of us with our small pouches this requirement can be daunting and leaves little room for variety. Bread is often looked at as a “waste of space” in our much smaller stomach. This is no longer true. The use of Whey Protein Isolate, one of the most absorbable types of protein, makes P28 High Protein Bread a great choice for bariatric patients. Whey Protein Isolate is also good for any patients who may have developed an intolerance to lactose post-op. No matter what surgery type you have Whey Protein Isolate is the best source of protein for you. P28 offers a high protein, low carb, low sugar, great tasting bread that we can now incorporate into our diets without the fear of dumping or intolerance. Coupled with anything from eggs to lean meat, a sandwich made with P28 allows us to intake as more than a third of our daily protein requirement! Getting in your protein while satisfying your craving for bread has never been easier. How do I properly store the P28 Spreads? We recommend that you store our P28 Spreads at room temperature. We don't suggest refrigeration/freezing. The Spreads will stay fresh for 1 year. What is the shelf life of the P28 Spreads? Our P28 Spreads last up to 1 year! 2.) Build and repair muscle and bones. 3.) Provide a source of energy. 4.) Control many of the important processes in the body related to metabolism. Whey Protein Isolate (WPI) is when the whey protein is filtered to remove any lactose, fat, and carbohydrates from the original protein. It is a by-product of cheese manufactured from cow's milk. Whey protein is the best protein you can get whether you want to build muscle, lose weight, and to get healthy. Is whey protein good for athletes and those who exercise? Whey protein is a high quality, complete protein and a rich source of branched chain amino acids and essential amino acids. These are important for individuals who are involved in sports, exercise, or do resistance training. The requirement for branched chain amino acids increases during exercise as they are taken up directly by the skeletal muscles versus first being metabolized through the liver, like other amino acids. Low levels of branched chain amino acids may contribute to fatigue and they should be replaced within 2 hours or less following exercise. Many athletes often take one-half of their whey protein drink before exercise to help optimize their workout. Whey protein also helps to repair and rebuild lean muscle tissue that is broken down by exercise. How does toasting our product affect quantity/quality of protein? Toasting may get some of the surface protein browned, known as the Maillard reaction, and/or burned (becoming ash). Those browned/burned proteins only represent a small portion of bread protein, and the blackened proteins will lose their nutrition value. Toasting will not further denature proteins since they have been denatured during baking. As a cooked egg white, further cooking neither re-natures the egg white nor further denatures the protein. How is protein affected in the baking process? Denaturation? All the proteins will be affected by baking process, so called protein denaturation. Denaturation is a process in which proteins lose their tertiary structure and secondary structure while maintaining their primary structure (the sequence of amino acids). Denatured wheat proteins increase their digestibility, therefore they become more nutritious to our body.